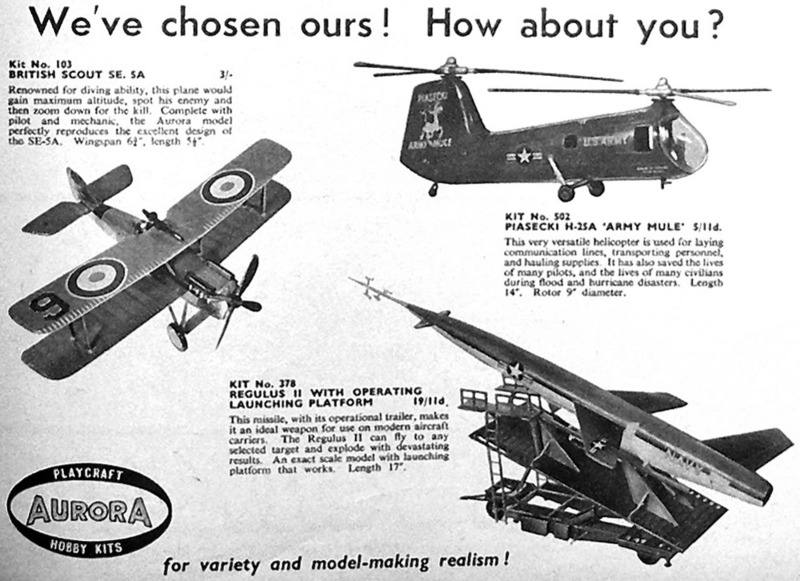 THERE WAS A TIME WHEN model kit companies weren’t averse to bringing in some star names to help push sales, which we saw in an old bound volume of RAF Flying Review magazine, which was loaded with ads for kits old and new. 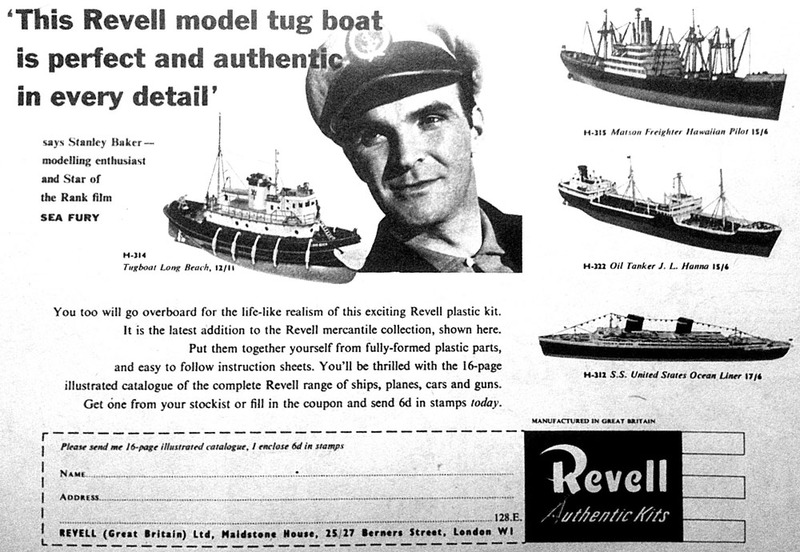 The Revell ad (header) used the Welsh actor Stanley Baker as star power to promote the Harbor Tug Long Beach (below). 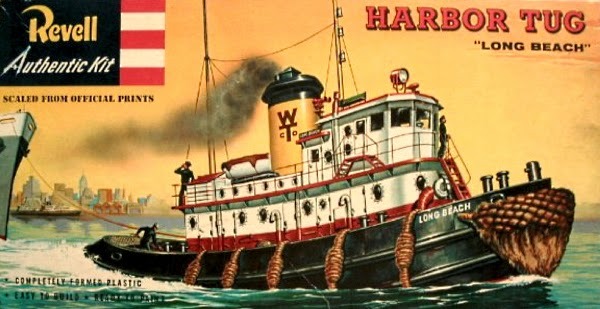 Baker starred in the film Sea Fury playing the role of a tugboat skipper, so the promotional link made sense, though whether it actually added to sales is another matter. 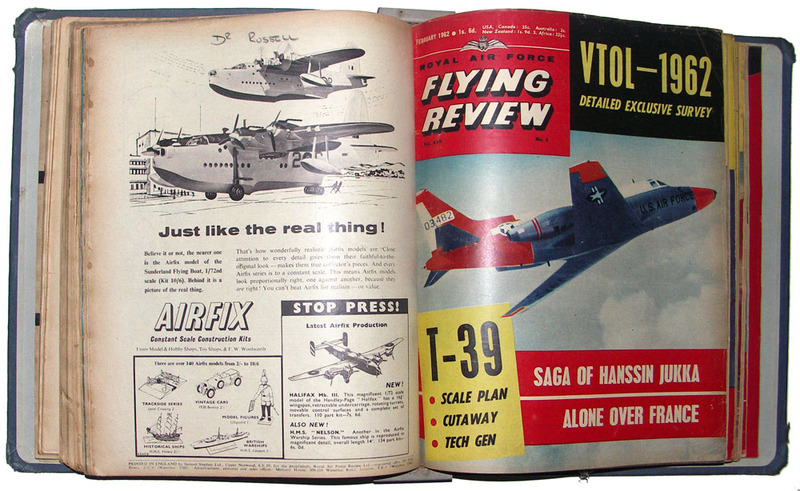 Other goodies in Flying Review's advertising pages included a half-page (below) for Aurora kits. The Regulus II missile came complete with a detailed operating launch platform, while the twin-rotor Piasecki H-25A Army Mule was in service with the US Army and Navy at the time. The kit wasn't exactly state of the art though, with sparse detail and nose glazing that was very basic indeed. 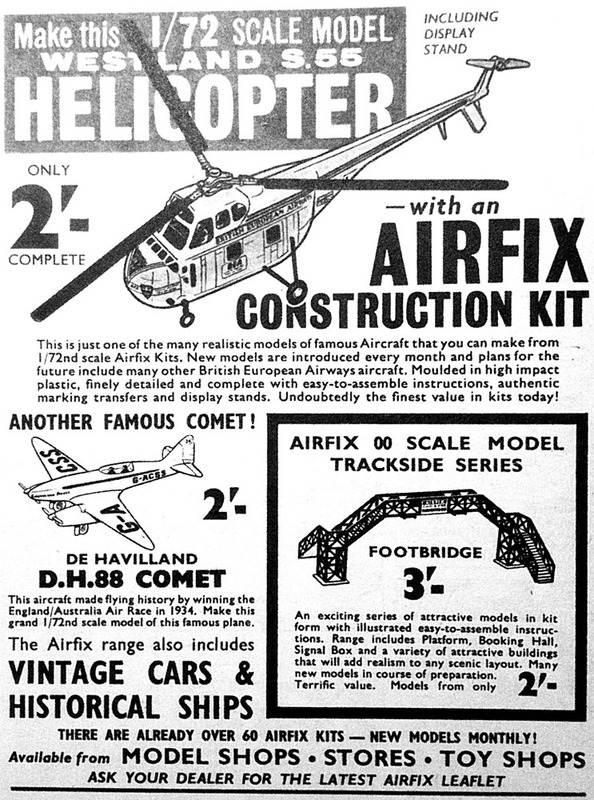 For British model makers, Airfix was the ultimate kit name of the time. Monthly releases sucked away many a schoolboy's pocket money, though prices were more than fair. 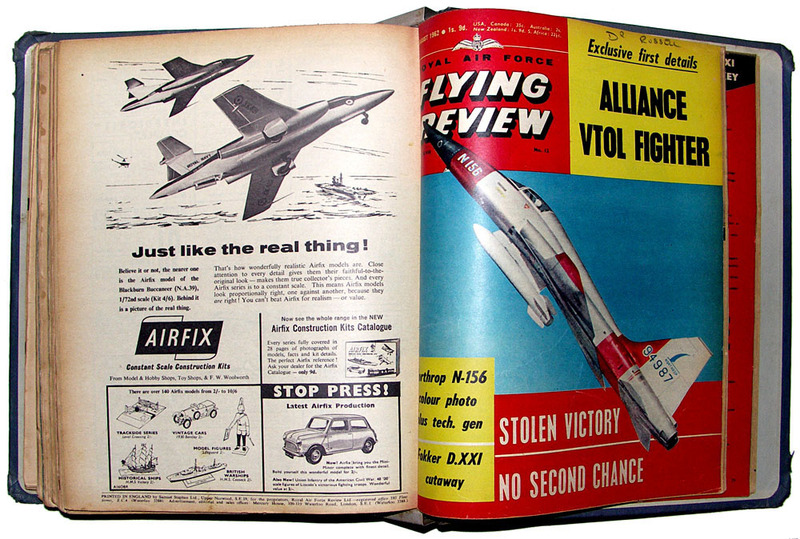 Airfix bagged the back page of the popular RAF Flying Review, with tempting 'Stop Press' offers and new releases. Some of these were not so hot though. The 1:72 scale Blackburn NA39 Buccaneer (below left) was poorly moulded, featuring a rotary bomb bay that did not fit properly or indeed rotate smoothly. We’re pleased to say that Airfix is still around - and making better kits than ever before - which is more than can be said for Keil Kraft (below left). 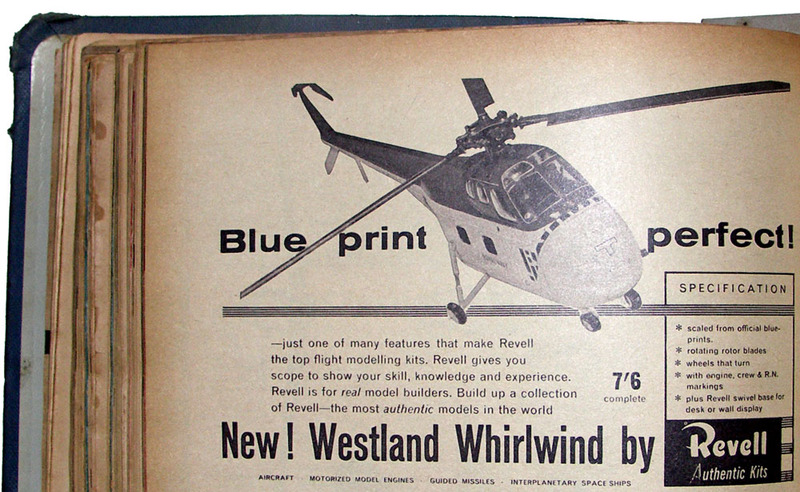 This was a manufacturer that concentrated on balsa wood semi- and non-scale planes and boats. 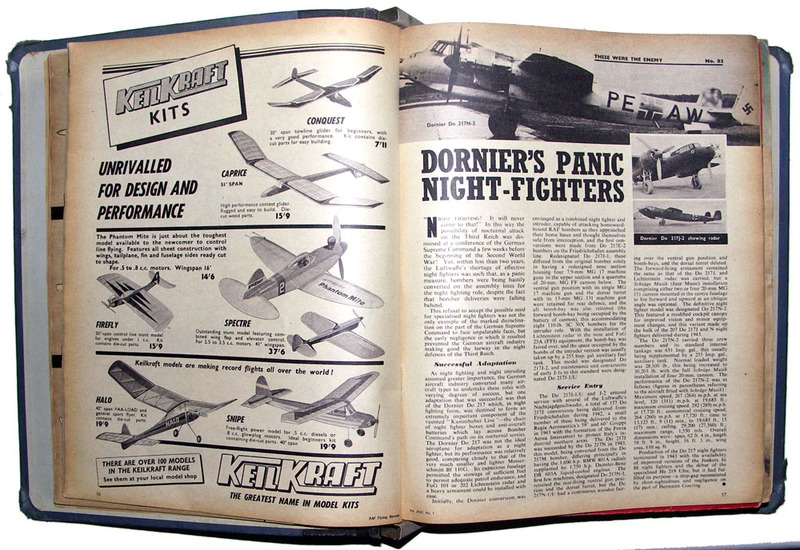 Keil Kraft's specialty was making flying models, so exact-scale aircraft on the lines of an Airfix injection kit was not a target, the real aim being easy-to-build and easy-to-fly models that could supply outdoors aerial action. The original company is no longer around, but the Vintage Model Company keeps the brand alive in 'Replikit' form. There is interesting stuff on Ernie Webster, one of the original Keil Kraft design team here. The Airfix Short Sunderland (below) is still made, even down to the same '2G' squadron markings. 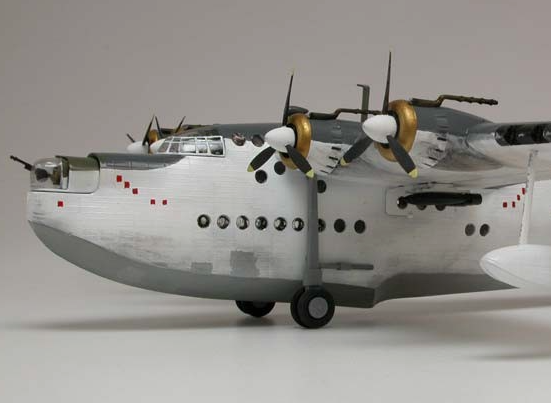 The nicely finished Short Sunderland (below) features on the current Airfix website. The model has been nicely weathered, without being too over the top. We would love to see a 1:72 scale inter-war years Empire flying boat from Airfix, or even (please) a Short-Mayo composite, featuring the Mercury mailplane, sitting piggyback on top of the bigger Empire boat. 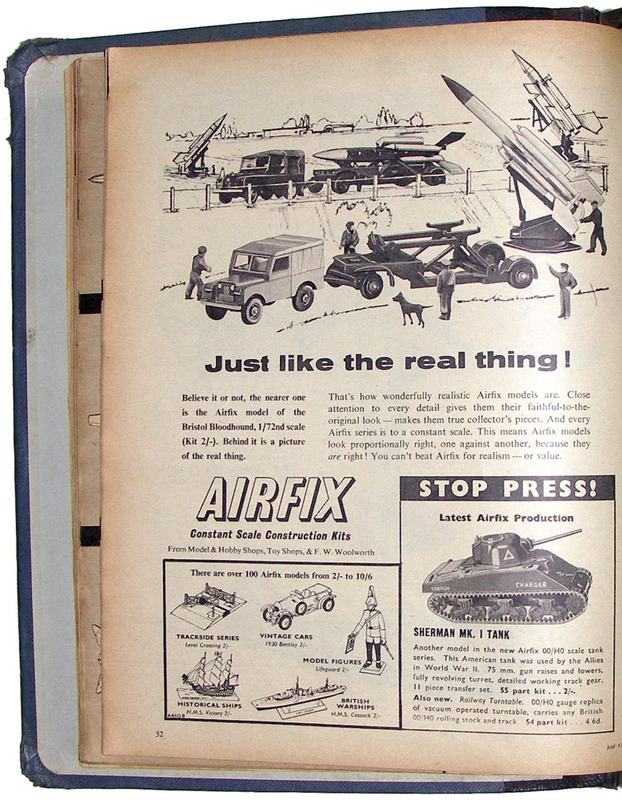 Two more Airfix ads featured the OK-ish Westland Whirlwind (above) and the Bloodhound ground-to-air missile (below) with Land Rover, towed transporter, and a launch pad. This was a well researched and produced kit that included five personnel, plus an alert-looking guard dog.